Knowing what blessings and after-blessings to make on foods is important, but it's also imperative to know how much food must be eaten in order to qualify for an afterblessing. Now, the complex and little-known topic of k'zayis (literally 'like an olive'--indicating the portion size that qualifies for an afterblessing) has become crystal clear and couldn't be easier to follow. This unique book shows full-size, color pictures of the most commonly eaten foods, indicating how much must be eaten in order to fulfill a shiur k'zayis. 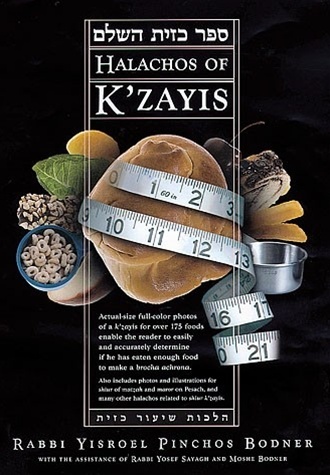 Includes modern snack foods, breads, and an entire section on k'zaysim on Pesach, and the formulas for calculating shiur k'zayis in foods of different shapes.